Floor protection has countless benefits on a jobsite, however its effectiveness is only as good as its ability to stay in place. Regardless of the type of floor finish and floor protection being used, tape is often necessary to keep floor protection in place. Red Poly Tape, often called “stucco tape”, is a construction-grade tape used on just about anything from stucco to corrugated plastic sheets. It has a much stronger adhesive than typical masking tapes, allowing it to be used on a huge variety of materials and textures. Red Poly tape is a 2″ x 60 yard tape, and is offered in single rolls, 6 packs, and in quantity discounted cases of 24 rolls. Due to the high strength of its adhesive many builders prefer to use Red Poly Tape on their floor protection over Ram Board Seam Tape. Corrugated plastic sheets, RamBoard, plastic sheeting, CoverGuard, Painter’s Board, and countertop protection can all be securely onto surfaces and seams held together with Red Poly Tape. This tape is now on sale on our website, where you can find a 6 pack of rolls discounted $15, and a case of 24 discounted over $50. 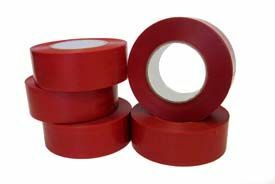 This entry was posted in sales & specials, Uncategorized and tagged polyethylene tape, product specials, ramboard tape, red tape, sales by admin. Bookmark the permalink.